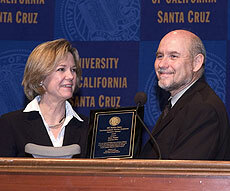 Dana Priest was on campus in 2006 to accept the Distinguished Alumni Award from Social Sciences Dean Michael Hutchison. Photo by Jon Kersey. Dana Priest, the Washington Post reporter who won a Pulitzer Prize in 2006 for her work exposing the government's secret 'black site' prisons, has won journalism's highest honor again, this time for her exposé of the mistreatment of wounded veterans at Walter Reed Hospital. Priest and her colleagues Anne Hull and photographer Michel du Cille received the 2008 Pulitzer Prize for public service for their coverage, which prompted a national outcry and government-initiated reforms at the hospital. The awards were announced today (April 7) by Columbia University. Priest graduated from UCSC (Merrill College) in 1981 with a bachelor's degree in politics. In 2006, she received the Division of Social Sciences' inaugural Distinguished Alumni Award, and she has been selected to receive the 2008-09 UCSC Alumni Association Alumni Achievement Award, which will be presented October 24 at the Cocoanut Grove during the campus's annual Founders Day celebration. The Alumni Association's award is given each year to a graduate who has brought distinction to the university. Priest is the fifth UCSC graduate to receive a Pulitzer, and the first to win the coveted prize twice. Other recipients include Hector Tobar (1992), Laurie Garrett (1996), photographer Annie Wells (1997), and Martha Mendoza (2000).